I’ve been often collaborating this past season with a community and colleagues here in Oakland whom are predominantly Spanish-speaking Latinos originating in several countries and cultures of Central America. That work together has been a germinating experience in me, reminding me of my own privilege and expanding my limited glimpse of a different cultural world-view than my own. I’ve been partnering with this Latino community as an advocate, coming alongside them and working with them at their request, asking for their direction, and seeking to listen to and work for the concerns that they formulate, articulate and own. I can say that I’m open, culturally competent, and aware of my own place of privilege. After travels, ministry, relationships and work in different cultural, national, class and linguistic settings, I’m clear on the reality that I am wealthy, intelligent, recognized and not over-looked. I have several college and graduate degrees. I’ve attended schools in different nations and languages. I have lived in upper-middle-class suburbia-dom, in a shelter, next to a prison, and in East Oakland. I’ve been the manager of temporary housing, a renter and an owner. I am someone that is noticed when I go places, not because I’m hot, or easy on the eyes, or worthy of paparazzi-like attention. I’m noticed because I have connections and know people from my past work, relationships and presence in our holy city of Oakland (and elsewhere). I’m neither famous nor forgotten, yet I am rarely overlooked or not noticed. In my work with these Latino hermanos and hermanas, I’ve been confronted with my own short-sightenedness, or maybe it’s more of limited vision. I struggle to be hopeful at times in the face of the problems in our city, the dysfunction I work within in the American Church of the early 21st century, as a parent of children in both private and public schools, as a person who lives with depression. And yet rarely do I despair because I fear, suspect, or even know – that no one else sees me, that no one will stand up for me, that I will always be regulated to the back of the bus, overlooked in the crowd, or need to be fearful of authority. I’m nothing special (nor am I unimportant). But I’m not called to save the world, or the only one that can do certain things. And yet I know that I’m worthy of attention, friendship, investment. I have hope that things can change, that I will change. It’s not just because of the faith that I have that God is making all things new, or the worldview with which I’ve grown up in upper middle class America. I know that I have value as a child of God, a person, a citizen, a friend, a colleague. But there are many in our city, with whom I work, of whom I’ve never heard, who do not think that way. They have never heard it expressed to them in words, deeds or actions that they are worthy of attention, that they will not be forgotten, that they will always have a place at the table. 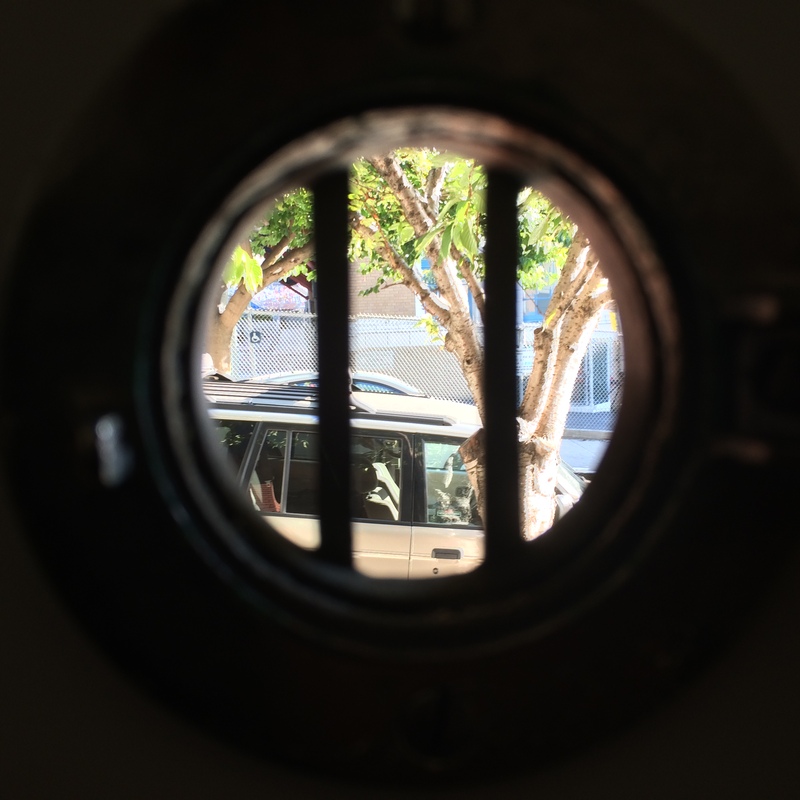 Several weeks ago I was at a family get together, and as I left I took this photo through the peep hole of the front door looking out on to the street. It was during Fleet Week in San Francisco, and the street was actually quite full of people meandering through the city. And yet when you look through that small lens on the door, you’d never guess or suspect that that was the case. That’s the best that we can do in terms of vision in life. It’s neither depressing or hopeful. It’s realistic. I can only see what I can see. I need others to help me see more. I need others to help me understand at times what I’m seeing. In the pastor letter that the Christian Apostle Paul wrote to the emerging church community in the ancient Greek city of Corinth, he talks about this paradox of sight. Paul is writing about how we see each other in community, how we are called to love each other as we are, as we are becoming and in what will finally emerges in the future time of completion and perfection. It’s beautiful, and a bit obvious. I’m aware that I see dimly. At times I need others to remind me of it. I also know (and am too often confident in the fact) that others see dimly too. What I all too often forget is that we all see dimly, from different points of view through differently small lenses. It’s up to me to proactively be a listener, a question-asker, present without taking up all of the space, a life-long-learner, in order for my dim-vision to begin to cross paths and cross-pollinate with other dim visions, in the hope that we might see a little less unclearly.